The score was low at 30% due to a happy reason. I was expecting to run in yellow zone for most of the time but it turned out that I was running mostly in green and kept on getting reminder to speed up. My target stride rate was 165 and I have been slowing down until last 15 minutes. Obviously my heart approves me to do stride rate up to 170 if my muscles and joints don't complaint I should be able to do close to 60 minutes for 10k at next run. This month I have done 62k which is a record when the weather is cooler I will be doing more. I'm so comfortable at 160 strides per minute now if I were a machine I will be turning the dial up a bit and do 165 coming Sunday. I'll be in yellow zone no doubt but I hope that would be lower end of the zone if I have good control of my stride rate. I tried today alternating stride rate between 160 and 168 for every 0.5k, this wasn't easy. I ran for the first time after updating iOS to 4.1 recently. 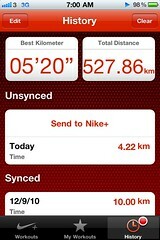 Found something new at the Nike+ app which enables me to upload my run data to Nike+ site from the iPhone. This is convenient saving me the effort of cabling up the iPhone to my MBP launch iTunes and sync. This page shows recent 2 runs. Too bad as Nike+ running site is still running Flash I won't be seeing graphical run graphs until they adopt HTML5. Also checked out Setting>Nike + iPod>Senor there isn't anything for Polar's wearlink pairing yet, too bad I will still be using my miCoach for running. I fact I prefer the miCoach site in terms of usability and user interface, Nike+ running site has to be completely revamped using HTML5 to catch up. According to the feedback given by miCoach I won't get anything better than 90% score. Again a short 180 strides per minute dash at the end I now have a very good handle on maintaining a stride rate of 160~162. This is a record I have done 31.6k in 7 days. The 10k today is my third one earlier records are appended at the end. Today my aim is pace control and I found stride rate of 160 is best to get me within green zone. 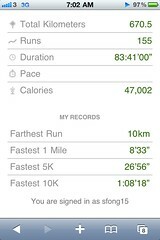 Pace wasn't my concern and my next target will also be training on time, perhaps 90 minutes next Sunday. I'm surprised that I'm still doing this. Getting up at 6am is the real challenge not the actual running on the road. Today with better pace control at the beginning I scored 90%. Now found that starting with the right pace/rhythm is very important. The road was semi-dry the sky was clear although the color looked a bit funny. Found no excuse so I went for my 4th consecutive morning run. My legs didn't complain and once I have started I didn't feel any tiredness. I had a pretty slow start never mind this experiment isn't about speed. I have a higher score today due to the slower than normal stride rate at the beginning so at the end I tried another dash (5:36 minutes per k) for the last 2 minutes. 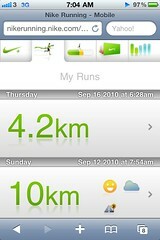 I felt a bit of tiredness in the legs this morning but it didn't affect the run. Pace control wasn't too good this morning and once 30 minutes was done I experimented a stride rate up to 180 (just below 6 minutes per k) at the end. Weather is about to change later today perhaps I could rest tomorrow? If I run every morning how many days can I run before I give up? I hope weather will be fine for this experiment. I didn't mean to stop running for 7 days I just can't due to typhoon "Lion Rock". As usual after long rest the score wasn't too good this morning. 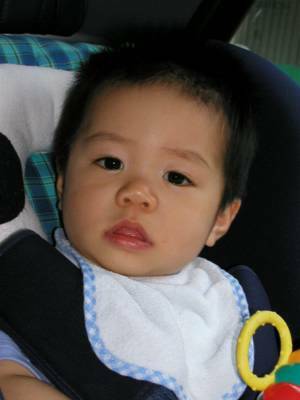 對上就 … 唉 … 因尚未做到＂海納百川, 有容乃大, 壁立千仞, 無欲則剛＂，這個嗎 … 只有多吞口水，少說多做為妙!